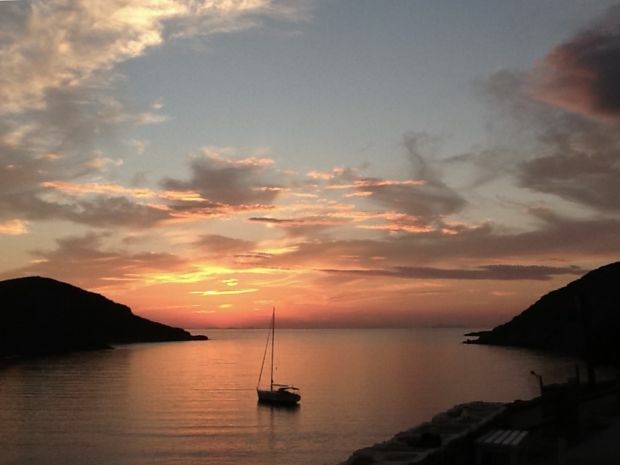 Each summer, Georgina Moon and her husband sail and live aboard their boat Fandancer in Greece. Follow Georgina as she discovers the Ionian Islands island starting from Lefkada. Recently, Fandancer made its way to the island of Meganisi, a must-stop for anyone cruising around the Ionian Islands.You can read more about Georgina’s experiences and trips for sailing the Ionian Islands in our Magazine and her 7-day sailing route from Lefkada. Meganisi is a small ‘C’ shaped island, just half a mile east of Lefkas island at its closest point. The wider northern coast of Meganisi resembles the fronds of seaweed, or the leaves of a tree, with many indentations, providing dozens of anchorages for cruisers who have chartered a yacht from Lefkas. The gently curving slender spine of Meganisi is low-lying with no towns of harbours. The main town of Meganisi is Vathi, often referred to as ‘little Vathi’ by cruisers, to distinguish it from the larger harbour of Vathi on nearby Ithica. To reach Meganisi by foot, you must take the regular ferry from Nidri on Lefkas, which also calls at Spartochori, another port on Meganisi, west of Vathi. The port of little Vathi is a very charming place, set in a large, deeply indented bay on the north coast of Meganisi, surrounded by forests and olive groves on the high ground behind the harbour. 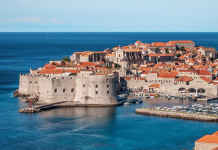 It has become more popular with cruisers over the years, especially with the development of the official marina on the western side of the harbour, which attracts large motorboats, as well as visiting yachts. Fuel, water and electricity are available at the marina, but you will be charged for a berth. However, it is usually possible to find a space on the town quay which can sometimes get busy with visiting flotilla boats. There are also spaces on the north-eastern side of the harbour, which has been extended over the years, to provide mooring for yachts. 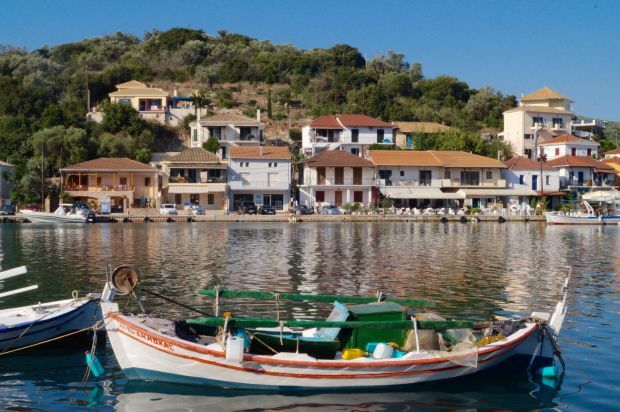 The harbour of Vathi is surrounded by cafes and tavernas, as well as a few old houses and a distinctive church tower. There are a few small shops for provisioning behind the shady town square, as well as a butcher’s shop, and a bakery nearby. 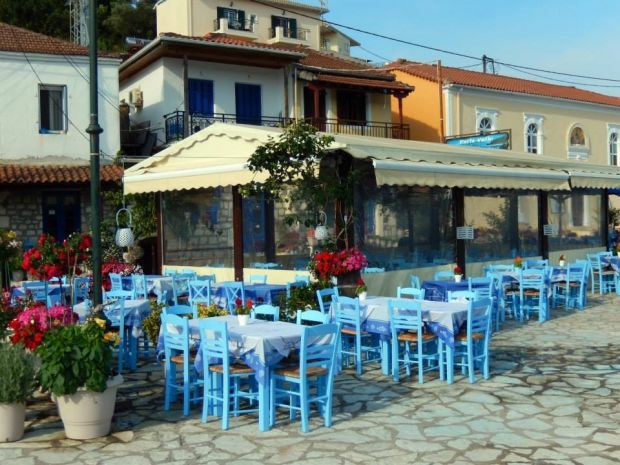 The Rose Garden taverna in the square is popular with yachtsmen and serves a good selection of Greek dishes. if you visit Meganissi when you charter your yacht from Lefkas, you will find Vathi to be a charming place. If you wish to stretch your legs and explore beyond the pretty harbour, you can take a walk uphill to the nearby village of Katomeri, approximately 3 kilometres away. 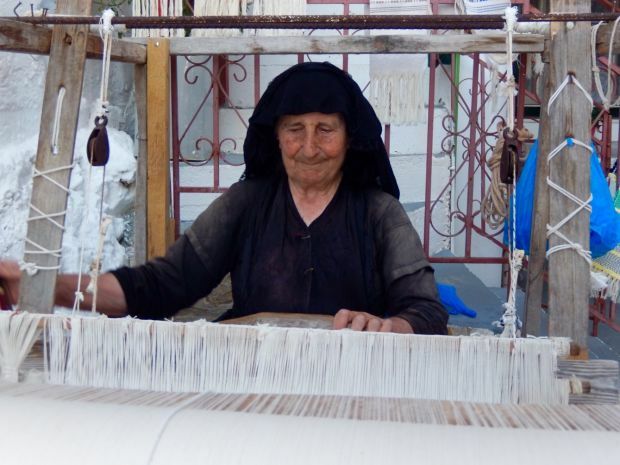 Equally charming, but with none of the tourism, Katomeri is an authentic Greek village where you will find whitewashed houses hidden in narrow lanes, old men drinking coffee outside the kafenion, and even a very old lady weaving cloth on her loom, as she has done for twenty years. There are a few local tavernas here, where you can sit and watch the village gradually wake up in the evening after a siesta. One popular place for a drink and a meal is taverna Tomboles, named after a card game invented by the original owner many generations ago, where his two great-grandsons now run the business. The only other settlement on Meganisi is the harbour of Spartachori, also on the north coast, which faces the small island of Skorpios, two miles in the distance. 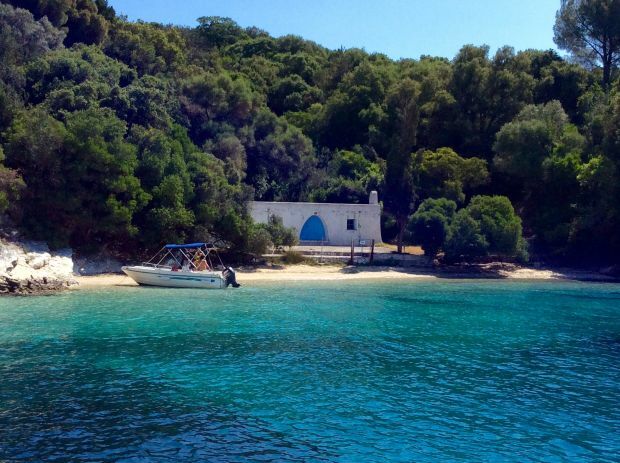 Once owned by the Onassis shipping family, the tiny island of Skorpios is now privately owned by a Russian billionaire, who is slowly renovating the buildings and gardens. It is forbidden to land on the island, but the white beach hut where Jackie Onassis was famously photographed while sunbathing, is still visible from one of the view places where it is permissible to anchor. Spartachori has a number of pontoons for mooring your yacht, but it is also possible to anchor and take your dinghy ashore to the attractive beach. An uphill walk will take you to the main town, where you can spend endless time wandering the maze of tiny streets. You will find gardens filled with colourful plants and flowers, tiny churches away in hidden corners, and you will be astonished by the spectacular views over the beautiful waters of the Ionian Sea. One of the main attractions of sailing to Meganisi are the numerous bays which provide dozens of places to anchor your yacht. The main bays are Kapelli bay, Abeliki Bay, and Port Athene, but each of these has numerous smaller bays and inlets inside each of them. You may find a quiet bay where you will be the only yacht, and enjoy a quiet evening watching the stars come out, with only the chirrup of cicadas in the trees for company. But in the busy summer months, be prepared for many boats to share your anchorage. It is very common to take long stern lines ashore from your boat and secure them to a tree or a suitable rock. In this way, your boat will be stationary, and a number of boats can moor together like this, without needing the extra space as when you free anchor. The water in the bays of Meganisi is incredibly clear and excellent for snorkelling. If you take the dinghy ashore, at almost every bay behind the trees you will find a little footpath to go walking, even as far as Vathi or Katomeri if you are feeling adventurous. Some of the bays have their own tavernas, such as the one at the southern end of Part Athene. There are also two tavernas in Abelike Bay, which is also just a short walk over the hill to Vathi. One of these Abelike tavernas is called Minas, which has their own pontoon for visiting yachts to use. They are open all day, and you can sit in their pretty, shaded garden under the peach trees while you have a refreshing drink and choose from an excellent menu of home-cooked food. They also provide laundry facilities and showers. The beautiful island of Meganisi is a perfect stop while sailing the Ionian islands. Start planning your next boat holiday in Greece and charter a yacht from Lefkas easily with Zizoo.